"Eggs deviled with crab meat, seasoned with Old Bay® and dry mustard. If you like Maryland-style crab cakes, you'll love these deviled eggs." Cut each egg in half lengthwise. Place yolks in a bowl; mash yolks with a fork. Stir crab meat, oil, 1 1/2 teaspoons seafood seasoning, and dry mustard into yolks; beat with an electric mixer on low speed to combine. Add water gradually to egg yolk mixture and increase mixer speed slowly, beating until smooth. Place egg whites on a serving platter. Spoon yolk mixture into egg whites; sprinkle with seafood seasoning. Simple deviled eggs are stuffed with crab then topped with even more crab. You may have some filling left over. As your reward for fixing this treat, spread leftover mix onto an English muffin and enjoy! 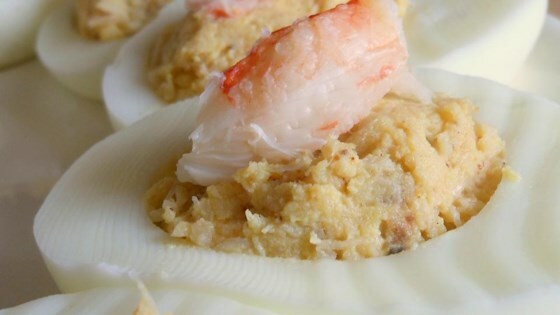 If you fix these for a gathering, be sure to include an allergy alert to warn of the crab content. All I could taste was the mustard.